On Friday, February 17th, USAID and KNCV organized a symposium to celebrate Maarten van Cleeff’s role in the global fight against Tuberculosis. Maarten van Cleeff, who retired this week, for many years led the world’s largest non-governmental anti-tuberculosis initiatives, funded by USAID with KNCV as the lead partner. His combination of experience, expertise, and dedication will serve as an inspiration to KNCV staff for years to come. 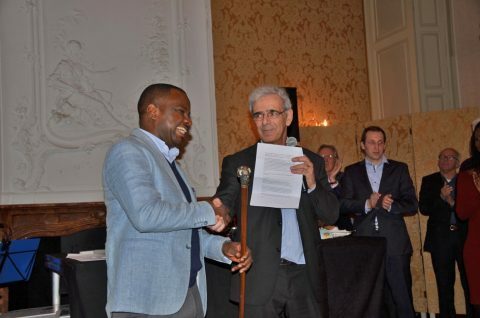 The symposium consisted of lectures and speeches by Kitty van Weezenbeek, Eveline Klinkenberg, Arnaud Trebucq, Susan van den Hof, Ellen Mitchell and Dr. Gidado Mustapha, Maarten van Cleeff’s successor as director of Challenge TB. They addressed an audience of almost 200 colleagues, friends and business partners who had gathered for this festive event. Furthermore, the event was enriched by Clare Pierard Dvorzac performing ‘Gypsi Song’, as well as by Dawit Tesfay who shared his inspiring personal story. The end of an era also means the start of a new one, and we at KNCV are proud to welcome Dr. Gidado Mustapha in his new role as Challenge TB Director..